In this study I will focus on two highly competitive locations - Brighton and Exeter. I will uncover which link building techniques have worked for the top-ranking estate agents and show clear patterns to their backlink proﬁles. Of course, this is just half of the picture when it comes to how an estate agent website ranks at the top. Luckily, I have produced my ultimate guide called ‘SEO for Estate Agents' over on my site, for further reading. Is SEO important for estate agents when Rightmove and Zoopla are such a powerforce? The simple answer to this, is yes. Despite Rightmove and Zoopla having built such a strong brand and lead generation system for estate agents, data shows us that people are still searching directly on Google. Below are some of the obvious search terms an estate agent would like to rank for. Aside these are an enormous list of relevant keywords people search for every month. - Search volumes for estate agents (your city) and what this tells us? ‘Estate agents brighton’ is just one search term that has 1000 searches a month in Google UK. These are people who are not heading directly to Rightmove or Zoopla, but instead will enquire on one of the page one sites for this term. ‘houses for sale in brighton’ has a further 1300 monthly searches in Google each month. Yet again, these 1300 people did not head directly to Rightmove or Zoopla. Which types of sites do top-ranking estate agents get links from? I will be proﬁling two Brighton-based estate agents - Mishon Mackay and Bonetts. I will also proﬁle two Exeter-based estate agents - Weekes Estate Agents and Wilkinson Grant. For the purpose of drawing better conclusions from the data, I have omitted any estate agency websites that are ranking at the top with a landing page for Brighton or Exeter. This is because these companies usually have tens of ofﬁces across the country and a much larger web presence/ budget for SEO. Essentially, it is not a fair study to compare national estate agents with local estate agents. Below are the volume of websites linking to each of the top-performing estate agents in this study. So what types of sites are linking out to estate agencies? Each site has industry-specific directory links. These are directories that are property-related, rather than a directory that will accept any type of business to be listed. All of the sites have a Dmoz listing - a must-have for any local business working on their SEO. Dmoz is a general directory and highly reputable. Good directories are your friend. As long as you have listed an accurate company name, address and phone number (NAP data), then directories can be very useful. Ensuring the directory is well maintained and your high-ranking competitors have acquired a link from the directory is important. This is because Google is now more sensitive to link building (since September 23rd 2016). The Google Penguin Real-time Update has meant that poor link building activity can quickly result in your rankings falling out of Google. This means spying on competitor’s link building activity is more beneﬁcial than ever. If you exhaust your possibilities of clean directories that the top-ranking estates agents have in your area, move onto estate agents in other cities. To qualify the potential value this link will have on your SEO, you can use ahrefs to gauge the power of the prospective site. 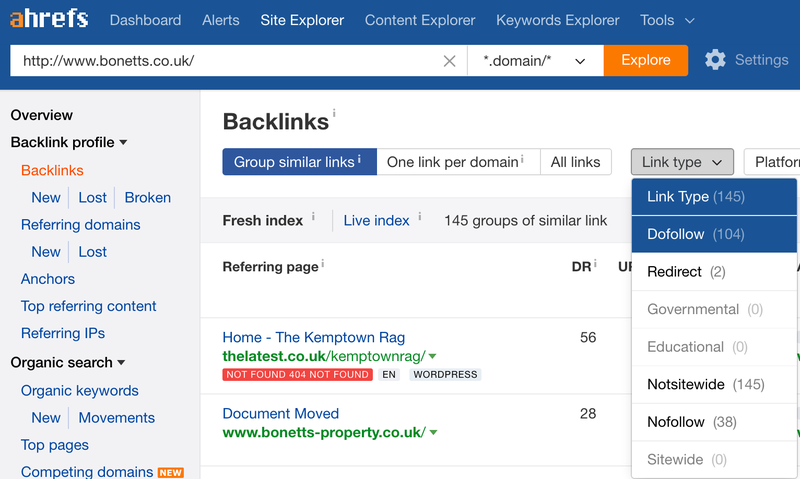 To do this you simply take the url of the website (like ourproperty.co.uk) and drop it in the site explorer in ahrefs. You will then see a ‘DR’ icon on a scale of 0-100. A website with a DR 10 would be questionable in terms of its beneﬁt right now, but at DR 54 this is a good prospect for your link proﬁle. Securing an inclusion on a news website is hands-down an incredible asset to your link proﬁle. These news websites are incredibly powerful, so if you have an angle you can pitch to an editor to get your property featured, then do it! See my tip here for how to pinch one of these placements for yourself. Sponsoring events is not something an SEO can do on your behalf. It is a business decision often carried out without any thought about the beneﬁt it could have on SEO. Similarly to the local tourism websites (mentioned later), sponsoring events, clubs and charities does provide geographical relevancy. It is also clear that a lot of other websites link to local events, clubs and local charities. More importantly it is often local news websites that link to these sites - this means you have a trickle-down effect when it comes to the link value. A link from a website that gets great links, means you will beneﬁt more. What an SEO can do, is provide you with the insight into the beneﬁt of sponsoring. Let’s not forget that the beneﬁt is greater than just improved rankings. Guest blogging is certainly not a dead tactic in your arsenal. What has changed is the quality of what you produce and publish on other websites in order to get a beneﬁt. Done correctly, guest blogging provides both referral trafﬁc and SEO value for your site. 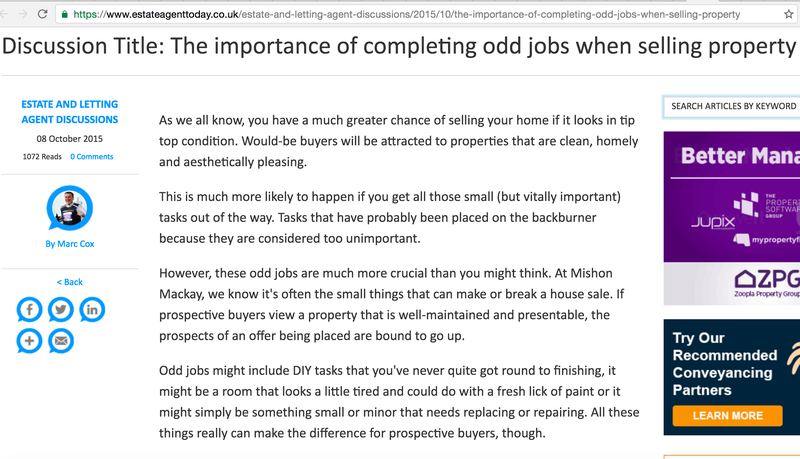 Below is a guest post Mishon Mackay wrote for Estate Agent Today. In this particular case, Mishon Mackay approached this in a less favourable way. 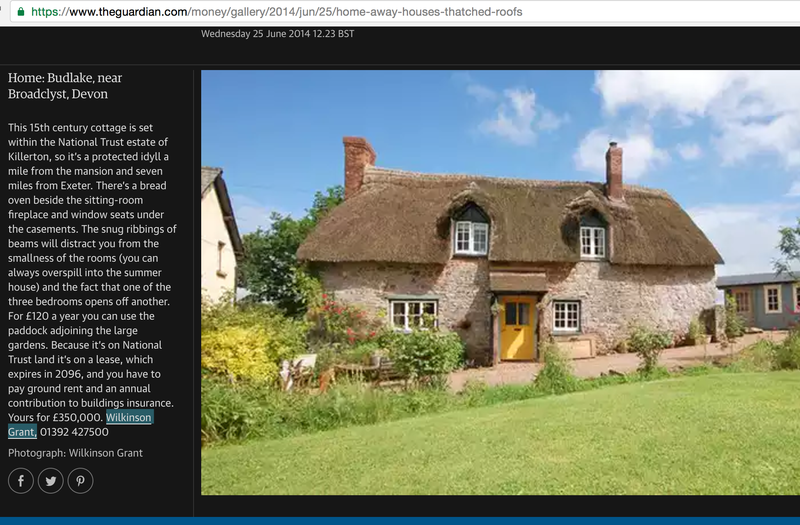 They published a piece of content on Estate Agent Today from their own blog. SEO logic would tell us that despite the guest post referencing the original publication url (a mustdo if you copy content), this can’t offer the same SEO value as a unique piece of high quality content. Ideally you produce high-quality content that appeals to the audience of the target blog and link back to not only your homepage, but also another resource you have for these readers. These sites provide Google with a good geographical relevancy. They help Google understand that you are a real business operating in the given location. 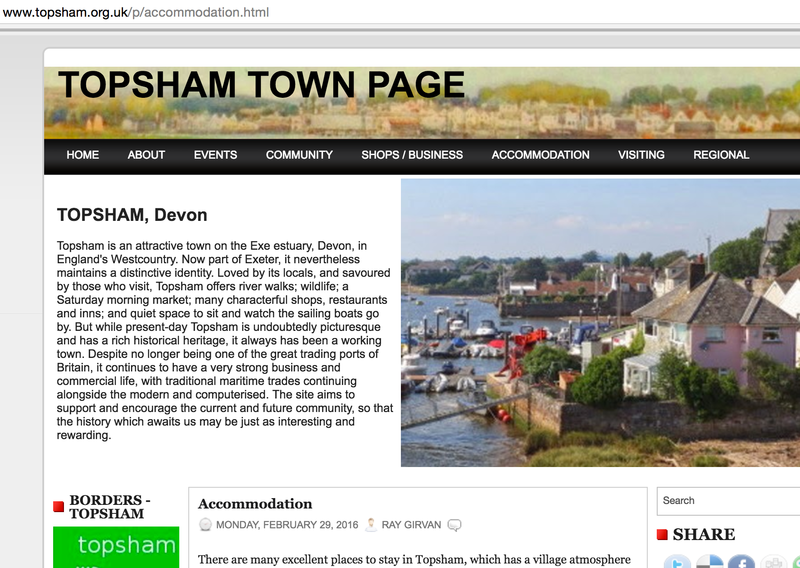 This site lists various estate agents in Exeter - a prime example of missed opportunity if you are competing in Exeter. As always, check the strength of the site and general quality of the content they are putting online before you approach to get a link. Anchor text is the text a website has used to link to you. 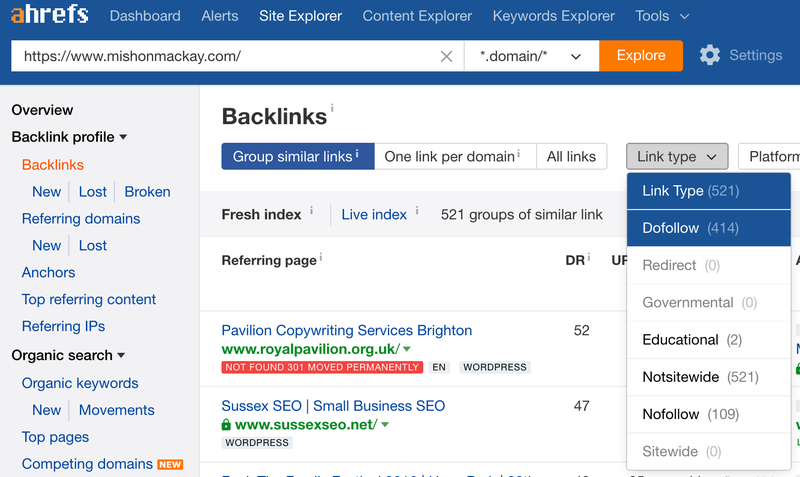 So for example, you can be linked to on your company name (branded link), your ‘naked’ website url, an exact keyword you aim to rank for (like ‘estate agents Brighton’), a portion of a sentence that contains your keyword or a ‘generic’ term like ‘click here’. These estate agents have steered clear of exact match anchor text such as ‘estate agents brighton’ or ‘estate agents Exeter’. Their anchor text used is on average 25% brand name (like ‘Mishon Mackay’) and 25% naked links (like www.mishonmackay.com). The remaining 40% is generic such as ‘visit the website’ and 10% for a variety of partial match keywords such as ‘Bonetts estate agents - property in Brighton’. With the exception of Weeks Estate Agents, the other estate agents did not rely on exact match anchor text or even high proportions of partial match anchor text as a technique. As mentioned on a recent ahrefs post, partial match anchor text is a clearly safe and powerful technique to bolster the impact of your links. Despite this, 3 out of 4 of the sites proﬁled clearly show that it is possible to rank at the top without relying on exact match or even partial match anchor text as the predominant technique. I would recommend starting out with branded and naked links to build 50% of your proﬁle (even split), then 25% on partial match anchor text and 25% on generic. Nofollow versus Dofollow links - does it matter what proportion of their links are dofollow? Nofollow links are links which tell Google to not pass SEO value to the outbound site. They are therefor not usually the primary aim of someone embarking on link building. It is fair to say most SEOs would be more happy with a Dofollow link than a nofollow. This is because it is undeniable that links that are Dofollow and from a site that is relevant enough and has a good domain authority, will beneﬁt your rankings. However, nofollow links could still offer a nice stream of referral trafﬁc, so don’t ignore a site on the basis that they only offer nofollow links. Below is a breakdown of the proportion of Dofollow to Nofollow links for the four sites. To see this information, put your competitors domain into the site explorer tool in ahrefs, click ‘explore’ and then go to backlinks on the lefthand side. Finally, click the ‘link type’ dropdown and you can ﬁlter links by Dofollow only or Nofollow only. These ﬁgures show that all the top ranking estate agents have more Dofollow links than Nofollow links. Ok, not a hugely surprising ﬁnding when we take into account that Dofollow links are links that pass SEO value. It does show that you need to be diligent when you want to get a speciﬁc link and see if the site usually links out with Nofollow or Dofollow links. 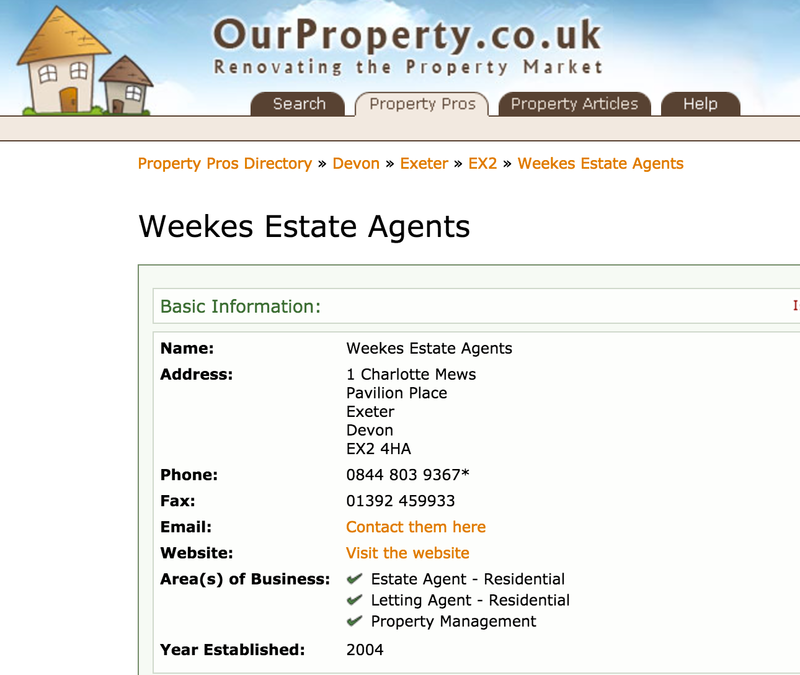 It is also worth noting that Weekes Estate Agents have acquired most of their links from just one website. This is a tactic I generally would not recommend, especially seeing as all the hundreds of links from that one domain are Dofollow links! Of course, this may have been by accident and not a deliberate technique. Link building can’t be ignored. Even with the best onsite SEO (topic covered in my free guide) you will struggle to get page one rankings without careful consideration for your link building. Get a mixture of the different methods built into your campaign, rather than overly exploiting just one method. There will be the anomalies. Those sites that got page one without ever actively engaging in link building. Their natural presence of many many years resulted in links forming as a bi-product. They got away with not managing bad links that naturally occurred and just found themselves there. For most estate agency owners, time is of the essence and a 6-12 month period of link building and good onsite SEO is better than relying on luck. Tom Clark is a freelance SEO consultant based in Brighton, UK. He helps companies achieve better visibility on Google. Find out more about Tom through his website, Convert Digital.